By connecting your workflows with the ATO, you can simplify your submission process, capturing all of the normal information in a digital form instead, and submitting it directly to the ATO at any point in a workflow, minimising physical paperwork and handling. 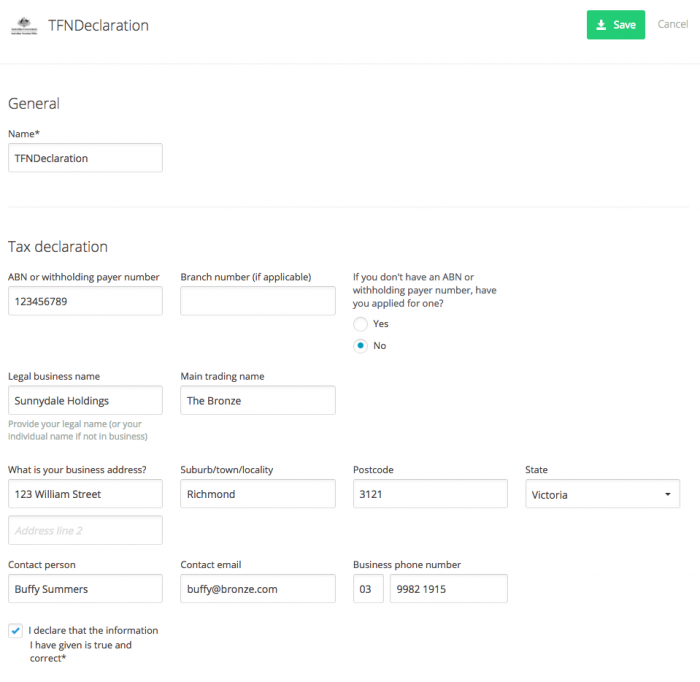 The ATO – TFN Declaration add-on can be added to your account by navigating to Add-Ons > ATO – TFN Declaration. Name: What the add-on will be called in your account. Tax Declaration fields: Should all be filled in specifically for your business, based on your registered details that you would normally use to submit to the ATO. The TFN Declaration and TFN Submission steps can be added to any workflow from the right hand ‘stage selection’ menu. Include the TFN Declaration in the steps required for an employee to fill out. Later, include the TFN Submission stage, which will send the necessary information to the ATO once reached. Return to this workflow and check that stage at any point in the future to check the status of the submission.